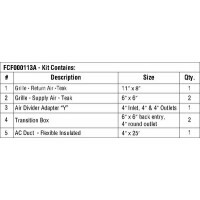 Dual duct kits can be used either on a new or retrofit installation and allows the air conditioning .. These air conditioning systems can be used for new installations or to replace your existing air con.. 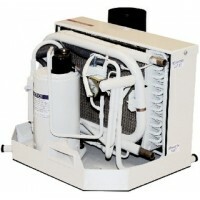 Complete installation kits to install the reverse cycle retrofit units. 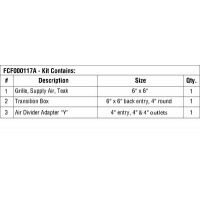 Includes supply grille, 12.5.. Round wire and mylar fabric shell ducting with 1" wall thickness of insulation. Size: 3" x 25'.. Round wire and mylar fabric shell ducting with 1" wall thickness of insulation. Size: 4" x 25'.. Round wire and mylar fabric shell ducting with 1" wall thickness of insulation. Size: 5" x 25'.. Round wire and mylar fabric shell ducting with 1" wall thickness of insulation. Size: 6" x 25'.. 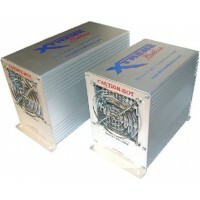 Compatible with an I/O or inboard engine with either a freshwater-closed or raw-water open cooled sy.. Replacement tube and fin heater core for 300H and 400H hydronic heater. 5/8" hose barb. 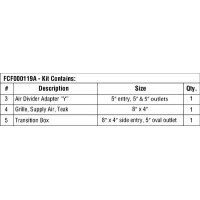 Includes 1-T..
Addl duct kt basic 12000-16000 For: 12, 000/16, 000 BTU..
Addl duct kit prem 12000-16000 For: 12, 000/16, 000 BTU..
Addl duct kit prem 5000-9000 For: 5, 000/9, 000 BTU..
Webasto's Feel Cool Fast (FCF) is a series of self-contained, reverse-cycle air conditioning units d..
Duct kit basic 12000-16000 Description: 12, 000/16, 000 BTU..
Duct kit basic 5000-9000 Description: 5, 000/9, 000 BTU..
Duct kit premium 12000-16000 For: 12, 000/16, 000 BTU..
Duct kit premium 5000-9000 For: 5, 000/9, 000 BTU..
Seawater kit 110v 5000 For: 5, 000 BTUVolts: 115V..
Seawater kit 110v 9000 For: 9, 000 BTUVolts: 115V..
Seawater kit 220v 12000-16000 For: 12, 000/16, 000 BTUVolts: 230V..
XTREME forced air heaters are small, highly efficient marine engine compartment heaters that will pr..